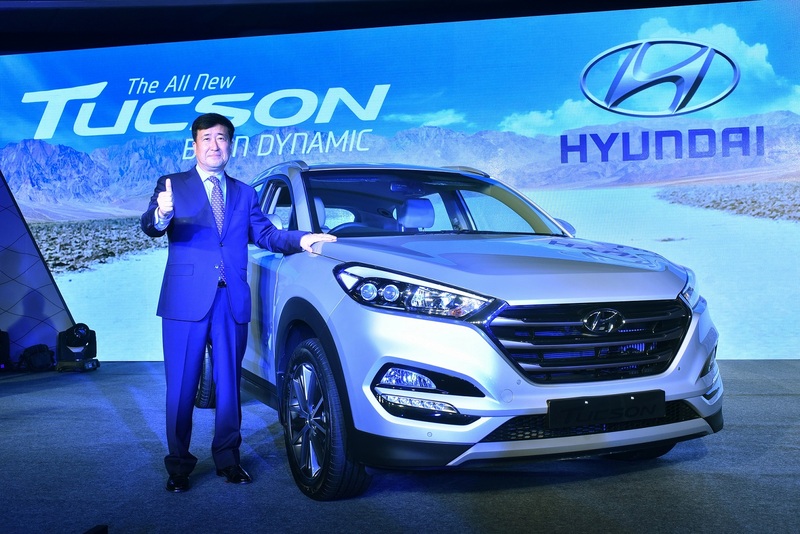 Hyundai Motor India Ltd., the country’s leading premium car manufacturer and the largest passenger car exporter, today launched its Global SUV ‘The All New Tucson – Born Dynamic’ in India consolidating its SUV line-up for the aspirational Indian customers. Hyundai’s vision is to be a Life time partner in automobile and beyond. We always seek to be around and near our customers. As a unique customer Assurance initiative, Hyundai has introduced Hyundai Premium Assurance Program (HPAP) which offers complete peace of mind for the customer with 3 years/Unlimited kilometers Warranty. The program also offers Free Maintenance for 3 Years/30,000 kilometers, 3 years Roadside Assistance, 3 times update on ‘Map Care’ and 3 times customer ‘Home Visit’. (Top-Ranked in Small SUV segment) J.D. Power U.S.
3 Sep’15 Top Safety Pick+ IIHS U.S.
4 Oct’15 5 Star Safety Rating Euro NCAP E.U. (International Family Vehicle Of The Year) Road & Travel Magazine U.S.
6 Dec’15 Good Design Award The Chicago Athenaeum, Museum of Architecture and Design / The European Centre for Architecture Art Design and Urban Studies U.S.
7 May’15 Top 10 Auto Show Debuts of the Year Cars.com U.S.
(Compact Crossover SUV) AutoPacific / IntelliChoice U.S.
10 Nov’15 Best Compact Crossover Ruedas ESPN U.S.
(Best Family Car) Recombu U.K.
Hyundai Motor India Limited (HMIL) is a wholly owned subsidiary of Hyundai Motor Company (HMC). HMIL is the largest passenger car exporter and the second largest car manufacturer in India. It currently has ten car models across segments – Eon, i10, Grand i10, Elite i20, Active i20, Xcent, Verna, Creta, Elantra, Tucson and Santa Fe. HMIL’s fully integrated state-of-the-art manufacturing plant near Chennai boasts advanced production, quality and testing capabilities. HMIL forms a critical part of HMC’s global export hub. It currently exports to around 92 countries across Africa, Middle East, Latin America, Australia and the Asia Pacific. HMIL has been India’s number one exporter for the last 10 years consecutively. To support its growth and expansion plans, HMIL currently has 466 dealers and more than 1,159 service points across India. In its commitment to provide customers with cutting-edge global technology, Hyundai has a modern multi-million dollar R&D facility in Hyderabad. The R&D center endeavours to be a center of excellence in automobile engineering.